Last night, around the dinner table, we sat and began to read through our memory jar from last year. The very first slip of paper was something my husband had absolutely no recollection had happened. As our kids took turns reading just a few of the papers, it was interesting how much we had forgotten that had happened. Two such powerful words. And because the passage I last blogged about continues to be thrown in front of me, I've decided I should really camp out on Isaiah 43:18-19. I can't even seem to get past these first two phrases to think about any thing new God might be doing that is even now springing up. The truth is that what we forget and what we remember greatly shapes us. Where we allow our mind to dwell has everything to do with how we live out our day, how we feel, and how our attitude is shaped. Just think about it. When you forget something good that happened, you miss out on the joy and encouragement. When you remember instead the bad that has happened, you linger in that, often growing irritable and bitter. Contrastly, when we choose to forget the negative things and instead remember the blessings, then we are encouraged and feel peaceful and hopeful. Where we intentionally choose to let our minds dwell has everything to do with how our days go. What we remember and what we forget are like rudders that guide our ship. They determine the direction of our thoughts, and then our feelings and then our attitudes and ultimately our actions. All this mediating on forgetting and remembering made me curious about what the else the Bible might instruct us to forget...and what it tells us to remember. Besides forgetting the former things and not dwelling on the past, as Isaiah 43 instructs. Some Biblical direction on what we are called to remember to FORGET. I think the Bible clearly points us toward being conscientious to let go of shame, disgrace, troubles, complaints, quarrels, anger, and former things that tripped you up. Choosing to forget these things--intentionally purging them from our minds and redirecting our thoughts is something we can do through the power of the Holy Spirit. We can be careful in remembering to forget these things...recalling what God has to say about reliving these places and continually resurrecting them. If we choose to linger there long, we breath life back into these things. And it defeats our ability for forward progress. NOW, on the other hand, the Bible has much to say about what we need to be sure and remember! These are things we must not forget to REMEMBER. If you do a word study on a website such as Biblegateway.com, you will find dozens of verses about what we must remember to forget...and what we cannot forget to remember. I have claimed the word freedom for myself in 2015. It would seem that my journey begins here. With diligently and repeatedly working on my memory. Choosing where my thoughts will dwell. It's my first baby step toward greater surrender to the Lord. And I venture to guess, it's quite applicable to you, whatever your struggle, whatever your journey. So, bloggy friend, here's your homework assignment. Take a few minutes in prayer and preferably, write out the answers to this question. 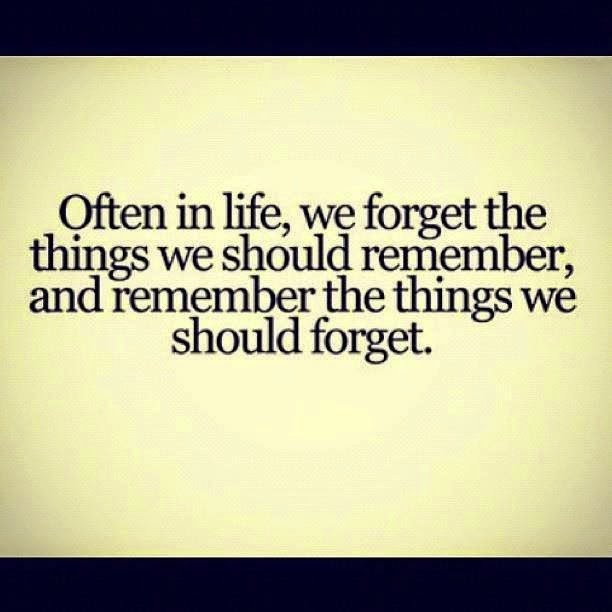 What quarrels, anger, complaints, troubles, disgrace, shame, and former things do you need to forget? Ask the Lord to reveal this to you. Where have you allowed yourself to be tied down, giving heart and head space to things which the Lord intends to replace with far greater things in order to move you forward? This is the baggage that you continue to lug around with you on your journey through life. Causing your back to break and your arms to ache. When all the while, God actually intends for you to check those bags. Just turn them in to him. There should not be a baggage reclaim, by the way. We must all--self very much included--work over and over and over again to keep those bags checked. Isn't it the best feeling at the airport when you've checked all that is heavy and weighing you down and you can walk freely and stop the ache of carrying too much with you? I believe this is a key to learning to walk freely and lightly on the unforced rhythms of grace, as Matthew 11:28-32 describes. Coming to him, all of us who are weary and burdened, so that He can give us rest. And then, in place of that heavy baggage we should forget, the Lord has some incredible things for us to remember. Some things to fill our minds. Truths to train ourselves to linger long and hard. His commands, decrees, laws, word, covenant, deeds, miracles, benefits,and the Lord himself. I know I included doing good in the list of things to remember...but here's the truth. When we train ourselves to stop our thoughts on how great and faithful he is and all that he calls us to do and does for us...the overflow is doing good. It's a by product of truly understanding who God is and of intentionally remembering the ways he has intervened in our lives. Forgetting and remembering. An important rhythm in life...an intentional rhythm which we train our minds to practice. And our thoughts, attitudes and actions will be transformed. I believe this is so key. To consider...what we must remember to forget. And release. And what we cannot forget to remember. And be transformed.